Swagbucks is going BIG this week to celebrate both our dads and our grads! 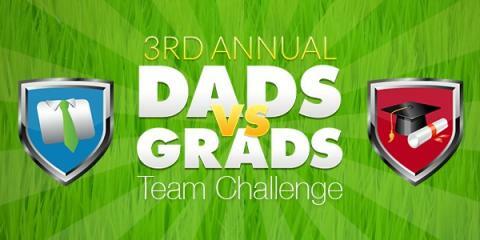 First, on June 10th, Swagbucks kicks off the 3rd Annual Dads vs Grads Team Challenge — it’s how they turn a little friendly competition into a SB-earning party! The team with the most points by noon PT on Friday wins! But as long as you contribute at least 1 pt to your team, you’ll win bonus SB: 25 SB for the 1st place team & 10 SB for 2nd place team members. HOWEVER: If you contribute 400+ points to your team, your bonus will be even BIGGER: 100 SB & 75 SB, respectively. To top off all the SB-earning fun, Swagbucks is also releasing a Dads vs Grads special set of Collector’s Bills today, 6/10. And tomorrow, Wed, 6/11, they’re throwing a GraDADuation Swag Code Extravaganza — your chance to win up to 35 SB in Swag Codes alone. Bonus: Those Swag Codes count towards the Team Challenge!! If you haven’t signed up for Swagbucks yet, sign up here to earn SB and get free gift cards.